Top Designer Clothing continues to bring in the latest styles and inspirations at the lowest possible prices. 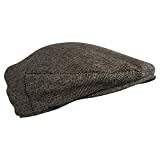 This smart wool mix hat is ideal for a country walk, a day at the races or worn as a fashion accessory. One of the eye catching trends this season. Grab a bargain while you can, when they are gone they are gone.